United Nations: India’s foreign minister accused neighboring Pakistan of harboring terrorists in an angry speech Saturday before the UN General Assembly and rejected the notion that India is sabotaging peace talks with Pakistan, calling it “a complete lie”. Hours later, Pakistan shot back in its own speech, accusing India of financing terrorists and declaring that New Delhi “preferred politics over peace”. India’s Sushma Swaraj pointed to the fact that Osama bin Laden had been living quietly in Pakistan before he was found and killed by a team of U.S Navy SEALs and said the mastermind of the 2008 attack in Mumbai, in which 168 people died, “still roams the streets of Pakistan with impunity”. Pakistan has said there is not enough evidence to arrest him. 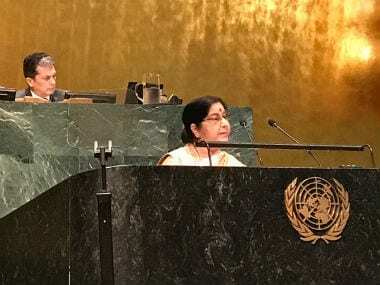 Swaraj and Pakistani foreign minister Shah Mahmood Qureshi were supposed to meet on the sidelines of the UN General Assembly this week. India called it off only one day after it was announced, after the killing of an Indian border guard in the disputed region of Kashmir. The two South Asian nations, always uneasy neighbors, face off under particularly tense conditions in that region at the Line of Control, which cuts through a rugged mountain range. The announcement of the planned meeting had been considered an encouraging sign for restarting stalled talks between the nuclear-armed neighbors. New Delhi had agreed to hold the meeting in response to a letter from newly-elected Pakistan Prime Minister Imran Khan, who has written his Indian counterpart, Narendra Modi, stressing the need for positive change, a mutual desire for peace and a readiness to discuss terrorism. Qureshi said it was the third time that the current Indian administration had called off talks, “each time on flimsy grounds”. He said in his speech that “Pakistan continues to face terrorism that is financed, facilitated and orchestrated by our eastern neighbor”. He referred to extremist attacks in his home country, including one at an army school in the northwestern city of Peshawar in 2014 that killed more than 150 children, which he said were perpetrated by “terrorists supported by India”. Qureshi’s afternoon speech prompted a vehement response from India, which exercised its right of reply at the end of the daylong meeting and accused Pakistan of spreading “fake allegations and fake facts”. Pakistan, in turn, responded by accusing India of “practicing terrorism as an instrument of state policy”. Since Independence from Britain in 1947, Pakistan and India have fought two of their three wars over Kashmir, divided between the two countries but sought by each in its entirety. He welcomed the release of a report earlier this year by the UN High Commissioner for Human Rights that mentioned “chronic impunity for violations committed by security forces” in Kashmir. The report was written without visiting the region as both sides refused to grant unconditional access to the investigators. India at the time rejected it as a selective compilation of largely unverified information. The UN has had a peacekeeping mission in the region since 1949, making it one of the world body’s longest-running peacekeeping operations. It is currently one of the smallest, with about 120 troops as of last month.